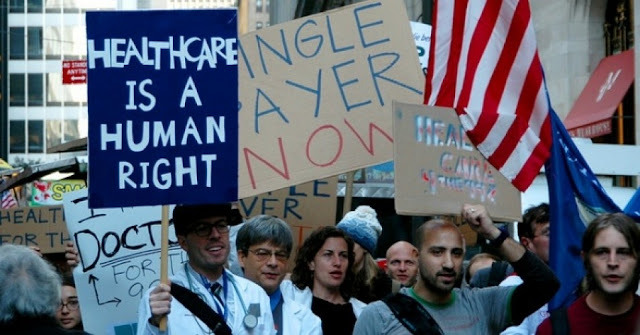 It’s time for a reality check when it comes to universal healthcare. Usually, that means those with an idealistic vision of equity and justice must give it up in favor a more achievable program. But in this case, the reality of what’s achievable exceeds the low expectations and compromises that have for decades limited the healthcare reform debate. Providing this reality check on how we turn from our wasteful healthcare industry to a system of guaranteed healthcare is a new study by the PERI at UMass-Amherst whose lead author is noted labor economist Robert Pollin. Through a comprehensive literature review and rigorous empirical work, the study show the average worker getting a 9% raise, and businesses saving 8% of payroll, as health outcomes improve, costs go lower and the economy benefits. Contrary to the doom and gloom of the latest healthcare spending numbers for the US—$3.5 Trillion overall annually, $10,739 per person, now exceeding 18% of GDP while providing worse outcomes, lower quality and shorter life expectancy than any other industrialized country—the Pollin study shows we can guarantee healthcare to all US residents by improving Medicare, and expanding it to everybody. The study answers the proverbial question—“But how do we pay for it?”—by utilizing the existing public sources that account for 60% of current financing, eliminating commercial insurance premiums, co-pays and deductibles, and replacing those with a combination of payroll taxes substantially less than employers are paying now, an upper income tax that makes the wealthy pay their fair share, and a sales tax on non-necessities. Paying for the new improved healthcare system is easier because of the cost savings achieved by S 1804, Senator Sanders Medicare for All Act of 2017, which the study reviewed. S 1804 eliminates administrative waste and inefficiencies—the claims denial, pre-authorizations, marketing costs, and profits of the insurance companies, and improves service delivery. Through negotiations modeled on other countries and the VA, the bill lowers prescription drug prices by an estimated 40%, and sets rates for providers based on Medicare, saving an additional 3% overall. The study shows that as we cover everybody with decent benefits, costs will likely rise about 12 percent. This is not surprising. People will seek care once barriers are eliminated since there are 28 million uninsured, and 30 percent of people with insurance coverage find themselves underinsured (nearly half of Americans went without some treatment in the last year because they couldn’t afford it according). But that cost increase is more than offset by the savings achieved under “single-payer” financing. It’s important to note that these savings are not available under a multi-payer system, under a system of Medicare buy-in, or via proposals that keep tens of millions of workers in commercial insurance plans. In such schemes, the administration costs for providers do not substantially decrease; 20% of the tax subsidies to buy insurance are wasted on overhead, marketing and profits; the leverage to set rates is not as strong; and individual purchase (“buy-in”) undermines the social insurance model that spreads costs. Nor can we expect to just cut prescription drug prices and leave insurance company rates and hospital charges untouched. Most important is to transition those people working in the health insurance industry, and in the administration of health services, out of those jobs in a secure way. The Pollin study addresses the “just transition” for workers through an income guarantee, complete protection of pension benefits, and job training. The estimated cost to the system is $30 billion per year for two years, again reflecting the reality of what it takes to create a restructured health system. That restructuring cannot happen quickly enough as we head toward a future of fragmented insurance markets, corporate healthcare silos like the CVS-AETNA company, “on your own your own care” via telemedicine, and diminished safety net programs. Our health is not a commodity to profit from, nor is it a welfare program to be minimized or privatized. The alternative—as the PERI study shows so clearly—is a just, equitable financing system of guaranteed healthcare for all. Yes, we can get more and pay less. The biggest change that would come is not financial: we can end the anxiety over healthcare. We can win peace of mind!